When we see the cute little sea otter, gently floating in the ocean and wrapped in a kelp blanket, I don’t think anyone thinks of the word predator. However, there is a group of fishermen that are hotly against this sweet little creature, because they are eating up the clams, abalone and mussels that the fishermen want. It’s no secret that mankind almost hunted the sea otter to extinction. They were easy to catch and their fur was a prized and sellable commodity for many years. While today, we might look at this practice in horror, wondering what heartless people could wantonly slaughter the sea otters; it will not be the first time that men overtook nature. The sea otter was once a flourishing creature throughout the many oceans from the North Pacific Coast all the way to Mexico. The conservation efforts have been valiant and today, we not only view these little critters with an emotional attachment, but with admiration at their ability to overcome all odds. There is much controversy on the topic of preservation for the higher level food chain predators. The fishermen are hell bent on taking their complaint to the state capitols as well as Washington, D.C. You see, they don’t like the sea otters because they consume what the fishermen want to catch and sell. Yes, it always comes down to the almighty dollar, doesn’t it? There are some considerations at play here, some in Washington, D.C. as they try to balance the needs of the sea otter with the needs of the fishing industry. One proposal is via the U.S. Fish and Wildlife Science regarding the Southern California law (of 24 yrs or so) entitled the “no otter zone”. These are areas that indicate if any sea otters are captured, they are to be relocated. There is another bill in Congress that would reinstate the ability for trade in sea otter fur only from sea otters that are trapped in southeast Alaska and used for subsistence. This little point seems to raise my eyebrows, as it will open up too many loopholes. There is growing research that is pointing to other beneficial reasons to not disturbing the sea otter. Kelp forests are the main North Pacific marine ecosystem foundation. They are proven wilderness areas that support a variety of fish and act as food for varied species. Thy also help to buffer the shorelines from exposure to waves and assist in the reduction of the erosion of coastal areas. The sea otters themselves are a main key to keeping healthy coastal kelp. 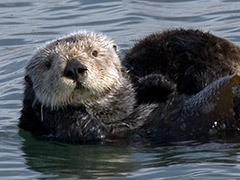 Sea otters are the major predator for urchins. Without the sea otter, the urchin population would grow to an out of balance proportion that they would affect the kelp forests and we would lose the benefits of the kelp as an ecological factor. Haven’t we done enough as a species to destroy the natural balance of things just for our own gain? Yes, the fisheries are looking hungrily at the various foods that the sea otters eat and wishing they would go away so that they could get at it and sell it. But as with everything, we, as humans, have a choice. It’s pretty easy too. Just make the choice to fish for something else, in balance, and leave our little sea otters alone. Posted on June 7th under Global Ecology.